Most news reporters do anything they can to avoid being part of the story, but this KUTV 2 morning anchor couldn’t avoid doing so when a mammogram she got to show viewers how easy the procedure was ended up showing some malignant cancer cells. Nickles (center) kept right on working after a lumpectomy and through chemo and radiation treatment, and kept Channel 2 viewers appraised of her ordeal via a blog, MarysCancerStory.blogspot.com. Years before KUTV 2’s ratings resurgence, evening anchor Mark Koelbel was handily winning this category—so, in a small way, City Weekly can take some credit for helping 2 finally become No. 1. You’re welcome; give us a wave across Main Street. Why do our voters keep coming back to Koelbel, even when shiny new suit-and-tie challengers are popping up all the time at competing stations? One newscast will make anyone a believer: He’s got the look, the skills and the rhythm (as we’ve mentioned before, Koelbel is a damned fine drummer) that most news-desk jockeys can only hope to emulate, much less match. First, a plea to ABC 4: Give Chris Vanocur’s weekend talk show, On the Record, a better timeslot—8:30 Sunday mornings just doesn’t work for us. How about 11 p.m. Sunday, after Sports Zone? Or on sister station CW30 as a lead-in to Saturday Night Live? Set him up with a comedy monologue and a band—could be good. In more reasonable hours on ABC 4, Vanocur the reporter is your No. 1 source for local political news and, more pressing, liquor-law wackiness—seriously, he’s like the John Stossel of booze news, minus the mustache. Perhaps you other reporters should get your priorities in order. 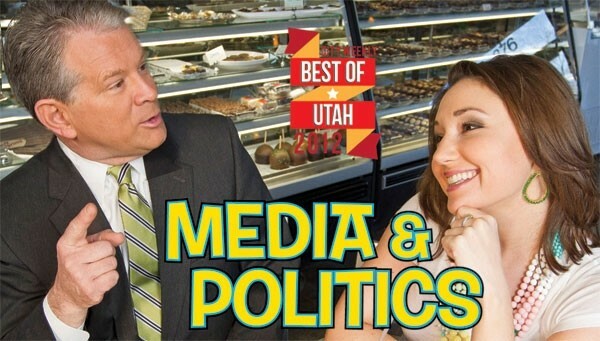 Proving its 2011 rise to dominance wasn’t a fluke (or the result of truckloads of freebie giveaways), KUTV 2 finished strong again this year—both in local ratings and, more importantly, our readers’ Best of Utah voting. Being affiliated with network powerhouse CBS doesn’t hurt, but KUTV’s uniformly solid newscasts and slick presence across mornings, afternoons, evenings and weekends, not to mention a relatively low turnover rate that keeps familiar faces on the screen, can’t be discounted. We’re still not sure what that afternoon “All-Lady Newscast” promotion was about, but who are we to argue with a media outlet that grabs these kinds of numbers? When you’ve got a talented employee, it’s smart to get as much out of him or her as possible. In Worthen’s latest decade-long stint at KUTV 2—following a brief traffic-reporter gig in the late ’90s—she has been an appealing meteorologist for 2 News This Morning. But she has also lent her energy and enthusiasm to remote spots out in the snow, in-studio shenanigans and hosting the daily Fresh Living program. That’s one versatile weather-guesser. Scott McKane, Fox13Now.com; Cristina Flores, KUTV 2, 6 & 10 p.m.